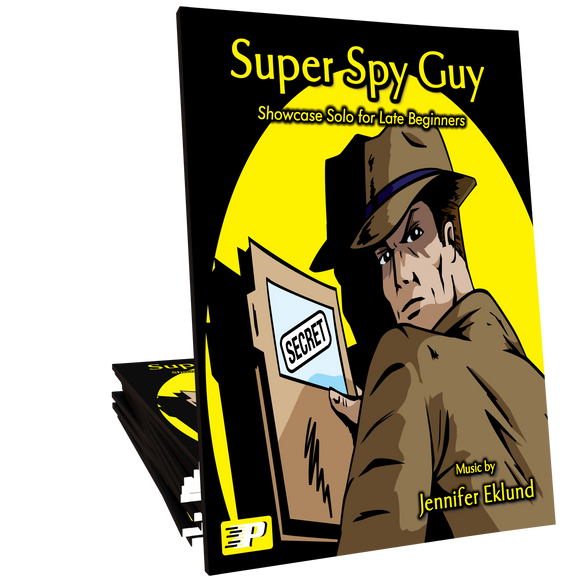 Super Spy Guy is a fun, minor-key piano solo for late beginners of all ages. 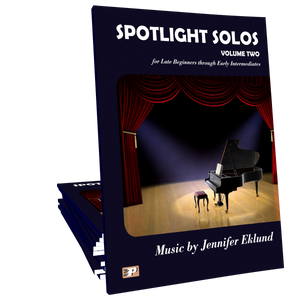 Composed by Jennifer Eklund and part of the Spotlight Solos Volume 1 songbook. Great for students who want “spy music” or “video game” music. 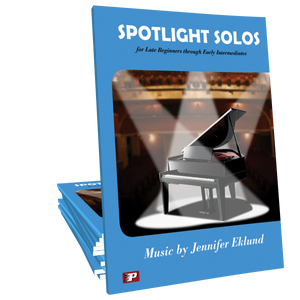 This is a fantastic solo piece for a Fall/Halloween recital or party. It is appealing for both boys and girls who can dress up as a detective for the performance. The level assignment hits the mark for late beginner. I just assigned this to a 12 yo. boy for our Halloween recital and he was seriously bouncing and jumping in excitement all over my piano room as I played it for him. He was equally as excited when he sat down to play it and was able to plunk out the first few lines hands separately. I have never seen a student so excited for a specific piece. Great music! Boys LOVE Super Spy Guy. It’s sneaky, exciting, and fun! Another great detective sounding piece for all. Well written for the level. My boys will love it.